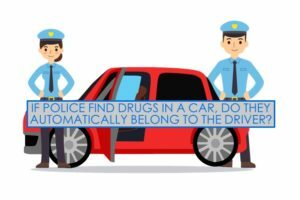 Do Drugs Found in a Car Automatically Belong to the Driver? Home » NEWS » Do Drugs Found in a Car Automatically Belong to the Driver? Between the Driver and Two Passengers, who is in Possession of the Drugs Found in the Middle Compartment in Plain View? The Court of Criminal Appeals recently handed down an opinion dealing with legal sufficiency of evidence in the context of possession of a controlled substance when it was not found in the exclusive possession of the defendant. The issue facing the Court was whether Appellant Tate intentionally or knowingly possessed methamphetamine by exercising “control, management or care” of the methamphetamine and he knew it was methamphetamine. Tex. Penal Code §1.07(a)(39). The Court found that a rational jury could infer that the owner and driver of a vehicle possessed the controlled substance found in the vehicle in plain view even when there were two other passengers. Tate was pulled over by Detective Beckham due to his outstanding warrants. When pulled over Tate had two passengers. Tate explained that he owned the vehicle but did not have any proof of ownership. Tate was arrested after officers confirmed his outstanding warrants. The police searched Tate, the two passengers, and their belongings, but did not find any weapons or contraband. During Officer Beckham’s inventory search of the vehicle, he found a syringe loaded with a substance later identified as .24 grams of methamphetamine. He found the syringe in “plain view” in a compartment underneath the air conditioner and heating controls. Tate, the owner of the vehicle, was charged with possession of a controlled substance. At trial, Officer Beckham described the compartment as “directly to the right” of Tate, accessible to Tate and the front-seat passenger but not the backseat passenger. He also testified that even though he couldn’t tell exactly what the front-seat passenger was doing, he observed her moving a lot but never towards the compartment. Tate argued that one of the passengers put the syringe there when Tate was talking to Beckham at the rear of the vehicle. The trial court found Tate guilty, relying on Tate’s “self-purported” ownership of the vehicle and his proximity to the syringe. There was insufficient evidence to show the syringe was in the car before Tate got out. Officer Beckham observed the front-seat passenger moving a lot but couldn’t tell exactly what she was doing. Additionally, the court said that since Tate’s ownership could not be proven it was insufficient evidence to prove possession. The CCA held that a rational jury, with these facts, could reasonably infer that the syringe was in the car the entire time. In coming to that decision the Court relied on the fact that the jury believed Beckham’s testimony that he never saw her reach for the compartment, that the back-seat passenger could not reach it, Tate said he owned the vehicle, and that the syringe was found in plain view. Therefore, a rational jury could infer that Tate would be aware of items in his vehicle in plain view, thus find he intentionally or knowingly possessed the methamphetamine in the syringe. the jury could reasonably believe Beckham’s testimony that the front-seat passenger did not reach over to the compartment and that the back-seat passenger could not reach the compartment. Thus, when the standard is applied here a rational jury could find the evidence sufficient to find Tate intentionally or knowingly possessed the methamphetamine beyond a reasonable doubt. The CCA found that the evidence at trial was sufficient for the jury to reasonably find Tate guilty beyond a reasonable doubt and that the court of appeals overstepped its bounds in assessing the legal-sufficiency of the evidence.